Latin for 'united', referring to the synconia. Mid-canopy tree (strangler fig) up to 38 m tall and 31 cm dbh. Stem with white sap. Stipules ca. 15 mm long, hairy. Leaves alternate, simple, penni- to tripli-veined, venation conspicuous, glabrous to hairy below. Fruits ca. 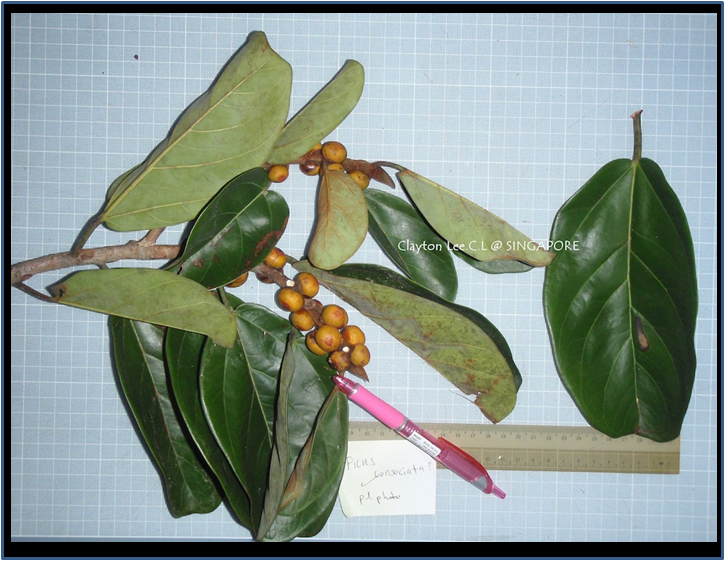 11 mm diameter, yellow-reddish, globose, fleshy figs placed along the twigs. In undisturbed mixed dipterocarp, (peat)-swamp, coastal and sub-montane forests up to 800 m altitude. On alluvial sites (swamps) but also common on ridges and hillsides. Usually on sandy soils. Burma, Indo-China, Thailand, Peninsular Malaysia, Sumatra, Java, Borneo. According to Burkill, like the India-rubber tree (Ficus elastica), it also produces a latex that was used as rubber. Unfortunately, the latex of this fig also contains a resin that hardens with time thus making the latex less elastic. Borneo: Arah, Kara, Kayu ala, Kayu ara, Kopoh, Lunok.